Tony’s Pizza sent me some pizza coupons for us to try out their pizza for free! Wooohooooooo no cooking tonight!!!! Hands down, that is the BEST thing about frozen pizza, right moms? All I have to do is throw the pizza in the oven, rip open a few bags of pre-packaged salad, and throw everything on the table. And I don’t feel guilty at ALL. 😀 It’s a wonderful thing. Well, being in Upstate New York, we KNOW pizza. I grew up in an Italian family in an Italian area, eating Italian food. And my best dishes are Italian dishes. Those Italians can EAT, I tell ya. So pizza is our speciality around here. We have lots of little pizzerias, which are stocked with yummy Italian goodness. But that stuff does cost a pretty penny. And it’s not exactly healthy to feed your face with 10 pounds of whole milk mozzarella in one sitting, is it? We’ve tried our share of frozen pizza, like any family. I will admit- I’m not a frozen pizza fan. I prefer to stuff my face with 10 lbs of mozzarella cheese, I confess. But when it comes to budget and to easy dinners, Tony’s wins hands down. That’s my honest opinion. 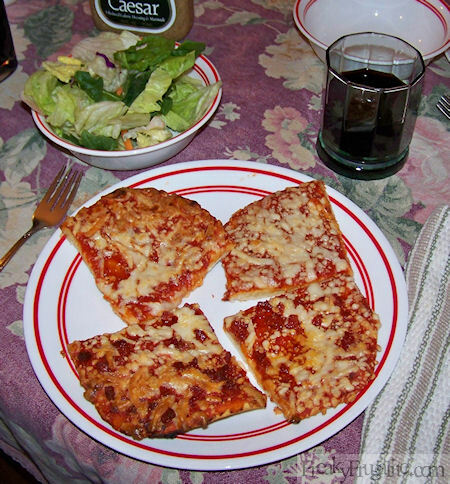 I don’t like the other frozen pizzas out there– some have too thick crusts and their “cheese-stuffed” crusts taste more like Elmer’s Glue. Then there are the super-thin pizza crust pizzas which are slathered with super-spicy sauce. I do not want heartburn later, thank you very much. Tony’s is not too spicy. They have the best sauce of any frozen pizza I have tried. I think they could add more cheese (heehee), but the taste is just right. And I am in love with how easy it is to make them. We got the individual sizes, which are great for limiting portions. We tried three varieties: cheese, pepperoni, and supreme. The husband liked supreme, but the kids and I loved the pepperoni best. The pizza is not too spicy, and for this I love it. I think other pizza makers dump loads of spices into their pizzas, because the freezing process makes the pizzas taste bland. But they don’t realize that their blends are disgusting. 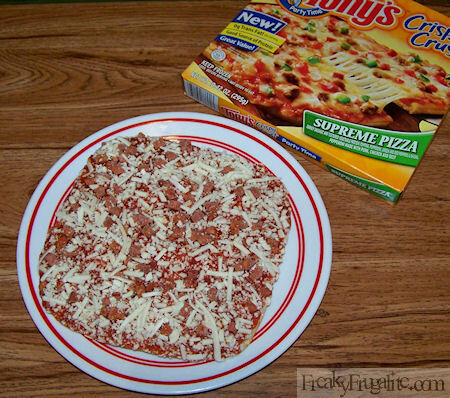 I like Tony’s because it’s milder, yet it still has great tomato sauce flavor. And the crust is GREAT. Not like eating a cracker! It’s very good. The Tony’s Pizzas that I got were $1.69 per individual pizza. Throw in a nice salad, and the cost for feeding a family of 6 is still very affordable. Plus, it is wonderful to not have to cook. Want to try some free Tony’s Pizza? I have FIVE coupons for some free Tony’s Pizza (up to $1.75 value) in my pizza-stained hands! 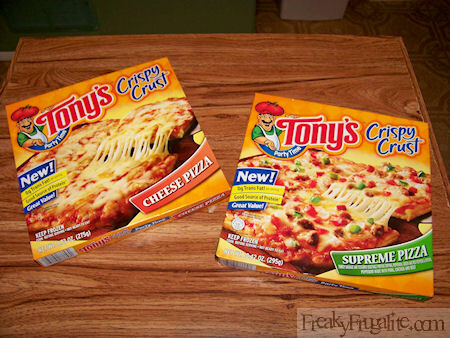 Each coupon is good for one Tony’s Crispy Crust Brand Pizza in any variety! To win these five coupons, all you have to do is subscribe to my blog, Freaky Frugalite, by email. The email subscription form is in my sidebar. Enter your email, and Feedburner will subscribe you. Then, come back and LEAVE a COMMENT telling me you have subscribed. I will randomly draw a winner on January 29, 2010. I will notify the winner via email by January 30, 2010, by midnight. If you already subscribe, you qualify for the contest already! Just be SURE to leave a comment here telling me so. Only a qualifying comment counts as an entry. You are making me hungry, Rebecca! Okie Dokie…I signed up and will now get your e-mails. I should have done this ages ago, I really like your blog.